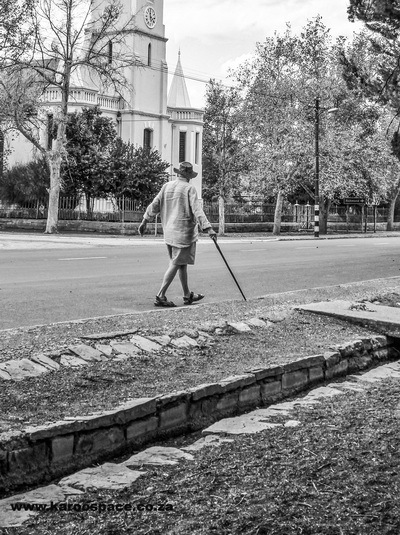 Chris Barr of Murraysburg striding past one of his pet projects – the water furrows of his town. “This dorp is small enough to get your arms around,” Chris Barr of Murraysburg once told us. 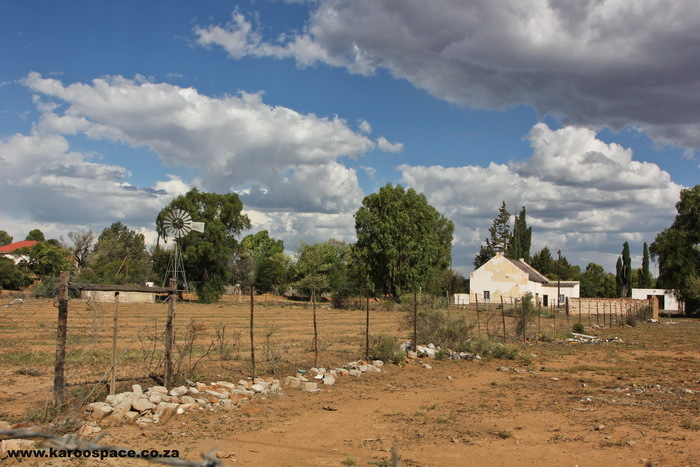 It was midway through a long explanation of why he’d embarked on a seemingly hare-brained scheme to restore the town’s leivoor (water furrow) system. It required the setting up of committees, the finding of old water rights and boreholes, a lot of physical labour and dealing with several kilometres of red tape with no help at all from the local authorities. Why would a highly qualified, semi-retired futurist dedicate so much time and trouble to a quest that would bring him little direct benefit except, perhaps, some level of satisfaction? “When I was still commuting a lot between Cape Town and Murraysburg, I’d drive at night and listen to the radio. I found it therapeutic. One evening, I was listening to an interview with a former Government Minister. The host asked him what the man in the street needed to do to get our country working properly. His simple answer stuck in my head. “He said that all of us had fallen into the trap of thinking that Government would fix everything. But it’s actually up to each one of us to tackle the problems we see around us. We each need to take responsibility for fixing our country. “I started looking at the town with fresh eyes, and I noticed that the water furrows weren’t working. Yet there is plenty of water around the town. A side road in Murraysburg. That lasted until 1988 when the weir was damaged by a massive flood. 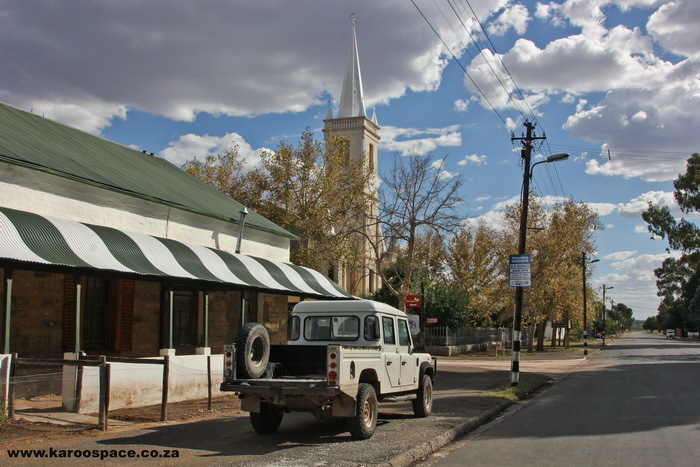 The municipality was quoted R8 000 to repair it, but the town fathers decided to save money by relying on a borehole instead. The Rooidamme which stored the water dried up and so did the leivoor system. After 1994, when the farmers started to pull their children out of the local school, everything went backwards. Murraysburg’s economy withered. “Water is the lifeblood. If we get the leiwater flowing through the town again, people can grow vegetables and fruit trees in their gardens once more. We can create a green belt across the township. At the moment there is no recreation space except for a cycle path and playgrounds with not a single blade of grass in them. Once water is flowing propertly through town again, large backyards can be used to grow food. 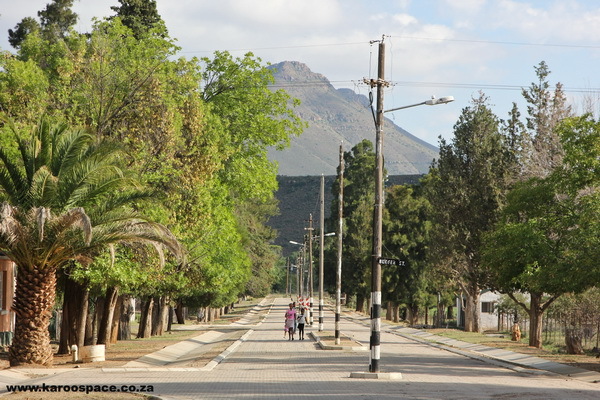 “The desperation in the township is absolute. You have to create a context within which change can occur. Without hope, without dignity, there is nothing. Today the key portion of the leivoor system has been completely refurbished and agricultural water is once more flowing into the town. More jobs are being created, one by one. 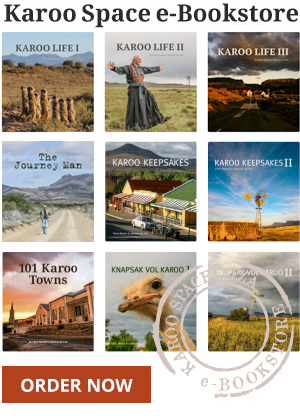 “My personal experience has also taught me that the most effective contribution or intervention we can make in our Karoo dorpies is not financial,” says Chris. “It is enablement. Many initiatives are still-born simply because of problems encountered that prove insurmountable to our disadvantaged communities. But show them how to overcome the problem and the initiative resumes. Nine times out of ten there is little or no cost involved except ‘sweat equity’, but the results are inversely proportionate to the investment! Of course, this is the best form of skills transfer. It is easier to turn around a small town than a big city. Chris Barr is one of many semigrants or incomers we’ve encountered over decades who have launched projects to uplift their new hometowns. Part of it seems to be because dorps operate on a smaller, more human scale. Positive effort usually has a tangible or visible outcome. Newcomers tend to arrive with fresh eyes and energy. They see more clearly what needs to be done, how it can be accomplished, and they seldom pay a scrap of attention to any entrenched reasons why this is impossible or undesirable. Over the years, we have encountered dozens of examples of their endeavours. 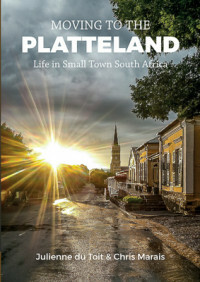 These newly minted plattelanders have tackled projects large and small, trying in many different ways to address the challenges of poverty, litter, poor education, malnutrition, mangy animals and dysfunctional municipal services. Some of these projects eventually wilted away. Others inspired similar efforts, or have made a striking and positive difference, not only in that little town but on a national scale. Lovely old places. Tranquility that’s all you need!!! Inspirational and well-written piece. This is what true dorp life is all about! Leave a Reply to Andrew Newby Click here to cancel reply.